Binny I have studied you for so long I feel like I know you. And I am praying you will forgive my informality. It has been 6 or 7 years since the first attacks. Your name is known across the world. Your crusade has not gone well. You have killed around 7,000 Americans in 5 years. You have lost two Middle Eastern Countries. Lost most of your cadre, and another 100,000 troops. to the rest of the Muslim world. and market places all an afront to Allah. a military base, they were holy within their own standards, no civilians. While al Qaeda has become unholy killing civilians, blowing up Mosques. Allah said : (Allah has promised, to those Moslems among you who believe and work righteous deeds, that He will, of a surety, grant them in the land, inheritance (of power), as He granted it to those before them; that He will establish in authority their religion -the one which He has chosen for them; and that He will change (their state), after the fear in which they (lived), to one of security and peace: 'They will worship Me (alone) and not associate aught with Me. 'If any do reject Faith after this, they are rebellious and wicked.) 55,AlNOOR. Moslems created the al Qa'ida. Finding the bodies of two soldiers Americkin Moktewati Cape in Mahmoudia agency right-particularly after six days of continuous search at the soldiers captured three American occupation forces found today on the bodies Moktewati head back to two of the soldiers still missing in the fate of the third soldier is unknown so far. Sources said police in the city of Mahmoudia to our correspondent that the two bodies were found near one of their orchards in the city have appeared signs of torture and severe Moktewati Cape and the American forces that monitored 200 thousand dollar award to whoever any information about the fate of the three soldiers are still continuing the search for the soldier in the third thousands of American soldiers deployed along with government forces, accompanied by air cover involving fighter planes, helicopters and unmanned spy planes in different parts of the city Dhwage Mahmoudia and Latifiyah, Yusufiyah, hoping to find any evidence to lead to a third soldier missing. only one source so far. Lamenting the occasion of the martyrdom of the military commander of Taliban KILLED SAME TIME AS DADULLAH. Today, as tragedy has befallen us in the new session (Arab Jabbur), killing twelve mujahideen mostly field commanders of the soldiers (Army of the Mujahideen) in the region in an ambush. Our sources indicate it will be released on Al-furqan, by the ISI. Their reports begin with, "The Islamic State of Iraq/ The news report". Will post up dates here in comments. CIA INCOMPETENT, DERELICT IN DUTY, DIS-ENGAGING IN TERRORIST WAR ON INTERNET. The CIA had an "Iraqi Rewards" web page in Arabic. Links to this page posted around the world, for informants to post info. Could be most useful in receiving TIPS on missing USA troops, but no. In the redesign of their web pages they have taken it down, making all those links to the Arabic CIA web page useless. Who in hell is making these kind of ridiculous decisions at the CIA. This shows the utter incomprehension of even basic concepts of how the Internet works and its uses. USA troops in extrema danger and CIA is out of the loop. An possible info tip link dropped Just when our Troops NEED IT THE MOST. THEY DON'T NEED THE LINKS ALL OVER THE WEB that direct tipsters TO THIS PAGE? THEY DON'T NEED INFO ANYMORE? IT MAKES ME WANT TO PULL MY HAIR OUT. This just makes me nutz. They are on the side of USA right? Jihadist openly recommending "you tube"
From Jihadist web site: THE PLACE TO POST TERRORIST VIDS. A new article posted on the jihadi forum alhanein.com on May 4, entitled "Supporting the Islamic State by Single-Handed Terrorism," instructs Islamist fighters to conduct lone acts of terrorism against people and groups involved with the Iraqi government. The article is authored by a user with the name Fahid al-Hadaithi who is relatively new to the forum (his first post was in February of this year), but already has more than 500 posts attributed to his name. Al qaeda is dumbing down from force of pressure. first they were using landlines, then cell phones or satellite phones, then delivery of tapes or CD's. Every time they found a way to communicate they got busted, killed. The newest method is the Internet, while very successful in recruiting, it should have been anticipated. This is not some great strategy its just another level down. Each less effective for communication but the new uses they have put the Internet to are amazing, and effective recruiting tools. AQ keeps running out of options and resorts to what is ever left. The pressure on their communications net are emmense and USA has tracked then every time they changed. There is no reason to expect anything less in regards to the Internet. This is not some new grand strategy its jusl the only thing left to them. 3 years to kill that many, RIP. AQ continues to shrivel and shrink, and even other Muslims are turring against them, they must keep hiding deeper and deeper, it is just a matter of time, so far USA has been Islam's proxy, Islam should be taking care of this problem, is it Islam's integrity or FEAR? The U.S. military IS IN A QUANDARY over what to do about YouTube and blogs, but Al-Qaeda has its own digital media division and grab the opportunity with both arms -- and is releasing propaganda videos and magazines, on-line at a ever increasing rate. The terror group's as-Sahab media division is now producing and releasing a video every three days, -- "doubling 2006's previous record rate of one every six days. "So far in 2007 as-Sahab has released 39 videos. In all of 2006 as-Sahab released a total of 58 videos. At its current rate, as-Sahab will surpass 2006's annual volume by early to mid-July. As-Sahab's video release rate is continuing to trend upwards and may reach one release every two days in the coming months. This unprecedented volume combined with the continued high production quality represents a significant dedication of resources by al-Qaeda to as-Sahab's efforts." The reward for their efforts are spontaneous terror groups springing up without direct guidance. USA is having some success in tracking the delivery of tapes and CDs, so this form of blind recruiting has a good risk reward ratio for them. Their propaganda arm cranks out videos with great soulful Nasheeds and magazines with enough spin on current events to make one dizzy. I find it amazing how wanabee Jahaids accept them without question or even checking the news. Another tract is to convince the world and Americans they are loosing the war, with extreamly violent videos, and how their propaganda efforts on the Internet are carried by the world news as NEWS, not PROPAGANDA. And many Americans buy into it on some level, wanting to hear "both" sides. USA needs to give the Miltary great credit for the fine job they are doing. OH I know there were rapes, murders, that is always BAD but there are 140,000 USA mostly teenagers over there with guns and bombs. And it has been estimated that 2 % of any population are sociopaths, on the hole not to bad. And in Vietnam USA lost 3,000 troops in one month, see graph, this time the Army lost 3,000 over 5 YEARS. I don't know how many times I have been talking to a jahidist on line and been told al Qaeda is a creation of the CIA and that the CIA is responsible for 911, And they believe it. Many of the Ummah confuse opinions with facts or evidence, and will present these opinions as FACTS. It make it hard to argue with them logically. It would not be hard to substitute some of USA'S own slightly modified videos for their videos on the down load site. I don't fear anything the Terrorists have to say, but I do fear not answering their lies. And the USA is not countering their lies, and the terror cells grow and multiply at the expense of the USA. Al Qaeda's basic hypothisis is flawed according the Qaaran, killing women and children is forbidden, bombig Mosques is an affront to Allah. The USA should be pumping out MTV type vidoes every week with GREAT Nasheeds AND PRODUCTION VALUES associated with American movies. USA is doing nothing in this arena, AQ has their demographic all to themselves, 15 to 30 yr old Muslims, they get one side, promised 72 virgins, praise, acclaim, montary rewards for their family and paradise in heaven, and an adventure with guns and bombs any boyscout would love. All boys love explosions and guns. as-Sahab, their media arm recruits suicide bombers around the world and USA does nothing leaving this areana all to themselves. And we and others suffer the attacks of sucide bombers world wide. Dadullah says he was training American suicide bomber just before he was killed, confirmed by intelligence sources. USA is not only fighting the last war, Vietman: but isn't even in this fight. This fight includes the hearts and minds of Muslims and Americans, they have been winnig and convinced the US press and the Democrats that the USA is losing the war, maybe convinced even you. On May 10, 2007, the Nine Eleven Finding Answers (NEFA) Foundation was able to secure access to an exclusive interview with Taliban military commander Mullah Dadullah--only 24 hours before Dadullah was killed by Afghan and NATO military forces. During what would become his final interview, Dadullah stated that American and British Al-Qaida recruits are in the midst of planning and training for new terrorist strikes in their home countries: "We will be executing attacks in Britain and the U.S. to demonstrate our sincerity," he explained in Pashto, "to destroy their cities as they have destroyed our cities." A senior U.S. official told the Blotter on ABCNews.com that recent intelligence reports confirmed Dadullah's claim that U.S. citizens were being trained in Taliban and al Qaeda camps. "The number is small, not large, but even once is dangerous," the official said. Thirty-six hours before he was killed by U.S. forces, Taliban Commander Mullah Dadullah said he was training American and British citizens to carry out suicide missions in their home countries, according to a videotape interview to be broadcast on ABC News' "World News" Monday. "We will be executing attacks in Britain and the U.S. to demonstrate our sincerity," he told an Afghan interviewer, "to destroy their cities as they have destroyed our cities." A senior U.S. official told the Blotter on ABCNews.com that recent intelligence reports confirmed Dadullah's claim that U.S. citizens were being trained in Taliban and al Qaeda camps. "The number is small, not large, but even once is dangerous," the official said. In the interview, Dadullah said, "This is our religious and moral duty to train suicide bombers against the nuclear power of the infidels, and they will be used when they are needed, whether they are one, 10 or 20." A day and a half after the interview, U.S. forces carried out a helicopter assault on Dadullah's hiding place in Afghanistan's Helmand Province. Dadullah's bullet-riddled body was put on display by Afghan officials to confirm he was dead. "His ego probably got the better of him," said ABC News counterterrorism consultant Alexis Debat. "The U.S. and Pakistan have done an excellent job of intercepting the couriers moving taped messages from al Qaeda and Taliban leaders. This is why we have not seen Osama bin Laden in some time," Debat said. Even considering what happened to the last two USA troops that were captured, there is reason for hope. After a careful review of both actions it appears that the last two were captured by accident, and were killed as USA's troops grew near, the killings were then just gut reactions of the terrorists and had no plan of action after capturing the troops. This time they were much better organized and have had time to think and decide what would be the BEST and HIGHEST use of the USA POWS. As I mentioned in my last article this was a stagnate position, it was known they would be there without direct over-site. The time of the attack 4:44 am could suggest a desire for a deserted battlefield. To attack a fixed position with an IED, and have the Insurgents close enough to to immediately fall on the troops and capture them indicates allot of skill and experience. I suspect someday we will find Qods hand in this. Al Qaeda get allot more propaganda out of LIVE USA troops for videos, forced confessions and as bargaining chips in negotiation with USA. A dead body is good only once for propaganda, while live prisoners are good for a video op over and over again. They can't negotiate for a dead body but 3 live troops, USA is going to listen, and the propaganda opportunities are unlimited with LIVE troops. If the USA search does get close they will kill them, and blend in with locals. This most probably has been months in the planning, its not likely they are even looking in the right place, and USA could search the actual building they are hidden in and not even find them, such are the possibilities of a hidden buried bunker etc. I would expect the main goal is to use the POWS to get USA to leave Iraq. They have to be careful not to incite the USA public with some torture video, that just pisses of the entire country. They are on a very delicate balance, and want to make the most of the POWS. They know how often radio checks are made, and even how long it takes an emergency reactionary force to commit and arrive, probably even knew where the reactionary team was coming from. The knew what the USA would do, they have seen it last time, and would probably have allowed for these contingencies. I think the request is "NOISE" to keep us looking in the wrong place. They have had a year to think and plan for this, and understand the value of the POWS, it is not likely they will waste this asset by killing them. There is reason to expect them back alive at some future point. Al Qaeda leader Osama Bin Laden is still alive but maintaining a low profile, Afghan warlord Gulbuddin Hekmatyar said in a latest video release. "According to my information Osama is still alive," Hekmatyar, a former Afghan prime minister, said in the video aired by Al-Arabiya television late on Sunday. "It is good" that Bin Laden "does not appear in the media", and "it is wise" that he "does not issue statements or tapes, even after a long while," said the warlord." It is good he does not appear in the media, it is wise? "even after a long time"
This guy isn't a mental giant. Ole Binny is either dead ( HE IS DEAD,Zawahiri's tape WITHOUT BINNY more Proof ) or the advanced stages of cirrhosis, with advanced ascites, multiple parencentesis has left his protien levels below 4 and in a near comatose state unable to communicate. His edema has left him almost unrecognizable, his fingers like huge sausages. Problems with the parencentesis leaking and diuretics not working. Close friends were able to recognize him. 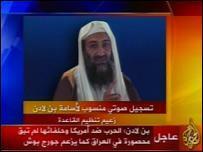 The last video of Bin Laden was released in late 2004, and the last audio recording was made public in mid-2006. Thats almost two years without a video and a year with no audio. There is something going on,and its bad for Binny and good for the rest of the world. It would also indicate they think its bad for the Islamofascists moral to disclose the details of his condition or death, either way he dies in bed. NOT a martyr. No 72 virgins for Binny. USA would dig him up to test his DNA. Binny has transposed jahid to Hirabah, and explain it as an Islamic obligation. The big picture is to form a caliphate from Spain to Northern Africa to the middle East and into Russia, a kind of Taliban control of Islamic life. This is a political movement masquerading as an Islamic cause. Binny's death sure would take AQ down a notch. Biny has seeping wounds on his belly from the parencentesis. And has spontaneous arterial bleeding near site of feeding tube. He is 60 to 80 lbs heaiver from fluid retention, and suffers heart problems. Some of the time he is delusional. From our operative with conncetions to Iranian resistance. this is just the main protests that were covered by the media roughly and is known about it outside Iran.Only covering 1 month. This is a link showing shots of today's huge demonstration of teachers in Tehran. Nearly, 4,000 teachers in Kurdish cities of Marivan, Sanandaj, and Saqqez gathered outside the local office of Ministry of Education in provincial capital of Sanandaj, according to the Resistance sources in Iran. On May 2, the striking teachers listed their demands including release of all their detained colleagues, banning police presence in schools, permitting the teacher unions, allowing teachers to elect their representatives and school superintendents. The teachers listened to a statement at the demonstration which called for freedom of all detained teachers, giving the voting rights to their representatives at the Supreme Council of Education, changing the standards for electing the teacher of the year, establishment of teachers' bank, abrogation of all restriction on teachers' assemblies by the State Security Forces (SSF), allowing teachers freedom of speech, and merging Ministry of Higher Education with Ministry of Education. April 28, 2007- Teachers Guild has called for a nationwide strike on April 30 and May 2. This strike is organized to express the teachers' objection about the arrest and lay off of their colleagues. Since last February, teachers have staged several strikes seeking pay raise, and it protest to oppression and control over educational institutions. They have gathered several times in front of the mullahs' parliament in Tehran. A number of the teachers who have taken part in strikes have been arrested or have been laid off by Ahmadinejad's government. The protest over mandatory dress codes began on April 20th,2005 ,when defiant students spent the night on campus and refused to go back to their dormitories demanding the school president's resignation. Students have been boycotting classes since, and staging sit ins till their demands are met. They also have called for uniform action with other students in major Universities. thousands of students at Shiraz University began their protest over mandatory dress codes set by the school administrators. They widely posted warnings on bulletin boards warning students to strictly obey the dress code. "Code of Ethical Conduct clearly sets the pace for students to follow," the state-run news agency ILNA reported. Defiant students spent the night on campus and refused to go back to their dormitories demanding the school president's resignation. Some huge bulletin boards are erected at the school's male dormitories with a statement ordering male students not to wear "shorts and tank tops in the dormitory's halls or where they sleep." This morning some 2,500 male and female students gathered on the campus's main entrance and did not attend regular classes in protest. The students shouting slogans such as: "Sadeqi, Sadeqi [referring to Mohammad Sadeqi the University President] must resign," "Incompetent School President must resign now." The students also prepared an eleven point resolution which contained their demands and on the top of the list was their request for the university president to resign. The students in Mazandaran University have begun their third consecutive day of protest on the campus in the northern city of Babol. Yesterday in the early evening hours four student activists were arrested by plain-clothes agents of Iran's State Security Forces (SSF), according to the Resistance sources in Iran. Later in the evening, fifteen other students went on hunger strike over the detention of their classmates. They were arrested in the same manner and were taken to an unknown location, according to eyewitnesses. On Sunday more students went on hunger strike and a sit-in took place in the university's cafeteria over arrest of their classmates. It is widely believed by the students that their friends have been taken into custody with the collaboration of the university's guards. ISNA a student news agency run by the government reported that only twelve students were demonstrating on the campus of Mazandaran University. The picture was shot by one of the students at scene of the demonstration. NCRI - Yesterday, teachers went on strike in various cites throughout the country, according to the information received from the resistance sources in Iran. In the capital ninety percent of high school and seventy percent of primary school teachers went on strike. Ninety percent of teachers in the north eastern city of Mashhad and fifty percent in the northern city of Sari did not show up for classes today. Since last night, the State Security Forces (SSF) attempting to break the teachers' strike attacked their residence and has arrested a large number of striking teachers in Tehran, Mashhad, Arak, Sari, Islam-Shahr, RobatKarim, Shahr-Ray, and Homayoon Shahr. Ms. Soheila Sadeq, Chair of the Education Committee of the National Council of Resistance of Iran praised the striking teachers and called on all teachers, university and high school students to support the teachers who are on strike. She called on all international human rights organizations and teachers' unions to condemn the suppressive measures adopted by the mullahs' regime and support the Iranian teachers. NCRI - Yesterday, the State Security Forces (SSF) raided the weekly meeting of teachers and arrested forty-five participants there in the western city of Hamadan, the state-run website Aftab reported. Arrest of teachers comes at the time when the Iranian teachers have call for a sit-in at schools on 16 and 17 of April. Teachers have declared that if their demands are not met by May 2 which coincides with international "Teachers Day," they will first demonstrate out side of their local offices of Ministry of Education in various cities across the nation and eventually they will have a gathering out side the Majlis (the regime's parliament). Ms. Soheila Sadeq, Chair of the Education Committee of the National Council of Resistance of Iran reiterated that the deprived teachers' legitimate demands are met by more suppressive measures from the inhuman Iranian regime and called on all international teachers' unions to condemn the suppressive measures against the Iranian teachers. She called on Iranian students and youths to support the demands of uprising teachers. How to treat a Muslom woman?